While the Mexican government has scrambled to present the Ayotzinapa student massacre as a case of low-level corruption that can be solved by shuffling police units and criminalizing the protests that brought international scrutiny, a new report emerged claiming that federal police also participated in the torture and disappearance of the students. U.S. intervention in Colombia shows why the state violence evident in Ayotzinapa is anything but an isolated incident. 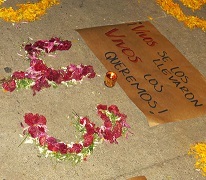 Photo: A memorial to the disappeared students in Iguala, Guerrero. “You took them alive, we want them back alive!” has become a rallying cry at protests around the world. Credit: Maggie Ervin / Witness for Peace Mexico. 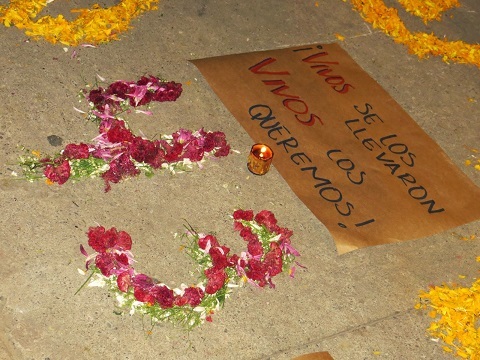 Until two weeks ago, there were 43 disappeared students in Guerrero, Mexico. Now there are 42. Despite tens of thousands of Mexican protesters chanting, “You took them alive! We want them back alive,” one of the students was officially pronounced dead on Saturday, December 6. Alexander Mora Venancio was just 19 years old. The identification of his remains was a transnational effort: Mexican officials found them, Austrian scientists tested them, and Argentine forensics verified them. But there are other countries with key roles in this story that have remained largely silent: the U.S. and its closest South American ally, Colombia. While the Mexican government scrambled to present the Ayotzinapa student massacre as a case of low-level corruption that can be solved by shuffling police units and criminalizing the protests that brought international scrutiny, a new report emerged claiming that federal police also participated in the torture and disappearance of the students. U.S. intervention in Colombia shows why the state violence evident in Ayotzinapa is anything but an isolated incident. Colombia is rarely in the U.S. news these days, despite an ongoing armed conflict well over half a century old. Unlike the Middle East, Colombia’s guerrilla insurgents, while on the State Department Terrorist List, do not haunt U.S. imaginations as an imminent threat; unlike Central America, Colombia’s internally displaced persons—over 6 million at last count—rarely make it to U.S. borders. This lack of coverage masks over 50 years of U.S. involvement. In line with the Cold War doctrine of containing communism at any cost, U.S. military officials under the Kennedy administration created paramilitary “self-defense” groups, called Plan Laso, to work in tandem with the Colombian state to crush leftist resistance in 1962—two years before the Revolutionary Armed Forces of Colombia (FARC) and the National Liberation Army (ELN) guerilla insurgencies were formally constituted. Soon after,Colombian drug cartels emerged to meet U.S. demand for cocaine in the 1970’s and 1980’s. That ended with the assassination of Medellin cartel kingpin Pablo Escobar in 1993, carried out with U.S. support. The Cali Cartel was defeated just a few years later, opening a vacuum in international cocaine distribution that loose criminal syndicates in Colombia and, notably, ascending cartels in Mexico were happy to fill. The fragmentation of the illicit drug trade in Colombia roughly correlated with market liberalization of the legal economy under President Cesar Gaviria with the slogan, “Welcome to the Future,” along with the Mexican financial crisis and passage of the North American Free Trade Agreement (NAFTA) in 1994. Throughout the 1990’s, the Colombian guerillas gained territory and soldiers, with the FARC’s ranks swelling to nearly 20,000 by 2001. This led to several key developments. The first was the 1997 consolidation of the United Self-Defense Forces of Colombia (AUC), a 30,000-strong paramilitary structure that collaborated with the Colombian military to commit some of the worst human rights violations in the country’s history before undergoing an incomplete demobilization process that left thousands of paramilitary descendants still active across the country. The second was a U.S. counternarcotics and counterinsurgency aid package known as Plan Colombia. Plan Colombia initially consisted of $1.3 billion in supply-side drug interdiction assistance, including a controversial and unique aerial herbicide fumigations program of coca crops, as well as weapons, equipment, technical assistance and training for Colombian military and police. It was signed by U.S. President Bill Clinton and Colombian President Andrés Pastrana in 2000, both of whom were succeeded by conservative presidents with tough counterterrorism ideologies (George W. Bush and Alvaro Uribe, respectively) that kept up support for Plan Colombia through 2007, when the name and strategy shifted to a “Consolidation Plan.” Presidents Bush and Uribe found a willing ally for the Wars on Drugs and Terror in right-wing Mexican President Felipe Calderoón, elected in 2006 after Mexican drug cartels had risen to prominence. Shortly thereafter, the Mérida Initiative—also known as Plan Mexico—was approved to “fight organized crime and associated violence.” Since that time, nearly $3 billion in U.S. military aid to Mexico have contributed to the massive militarization of the country: Blackhawk helicopters (at $20 million apiece), thousands of U.S. weapons, extensive training of police and military, increased surveillance of the border and ports, and even U.S. Marshals dressing as Mexican marines to carry out special operations on Mexican soil. The toll on Mexico has been devastating: more than 100,000 dead and more than 26,000 disappeared since 2006. Meanwhile, the U.S. has provided over $8 billion in aid to Colombia, making it one of the top recipients of U.S. military aid in the world. Yet Colombia is still a top supplier of heroin and cocaine to the U.S. The number of victims in Colombia’s conflict now tops 7 million , including 6 million internally displaced persons, more than 150,000 forced disappearances and more than 930,000 homicides. But a staggering 5.9 million of these human rights violations have occurred just since 2000, when U.S. funding began to bolster public security forces already known for human rights atrocities. 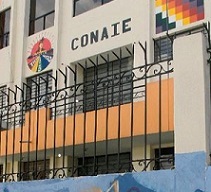 Then in 2006 the “false positives” scandal broke, in which it was revealed that Colombian security forces— some trained on U.S. soil at the polemic Western Hemisphere Institute for Security Cooperation/School of the Americas (WHINSEC/SOA)—systematically murdered at least 5,000 innocent civilians and then dressed them up in guerrilla fatigues, presenting them as enemy kills in order to gain rewards like bonuses and extra vacation time. This practice was developed as part of the “body count” mentality promoted in U.S. training and occurred on the watch of then-Defense Minister and current President of Colombia Juan Manuel Santos. Later that year, the “parapolitics” scandal broke, implicating politicians at all levels in narco-paramilitary structures. These groups, now referred to by the Colombian government as criminal bands (BACRIM), continue to enjoy close relationships with both licit and illicit business interests and politicians in Colombia, and pose the greatest threat to citizen expression and social movements: Plan Laso’s legacy continuing to pay dividends. U.S. officials stubbornly defend their investment in Colombia’s military might and its applicability to Mexico. One U.S. Embassy official in Bogotá said, “In 2000 Colombia was on the brink of becoming a failed narcostate. Plan Colombia helped prevent that…now, Colombia is a security exporter. Now the Colombians are training the Mexicans in security.” In a visit to Colombia just last week Secretary of State John Kerry echoed that sentiment. Indeed, direct aid to Colombia has declined since 2008 and proportionately increased for the Merida Initiative, and even more recently to the Central America Regional Security Initiative (CARSI). Along with increasing military and counternarcotics aid to these countries ,the U.S. has made a conscious move to use Colombia as a security proxy, providing the U.S. with plausible deniability in the case of human rights abuses committed by their trainees. U.S. General John Kelly got himself into hot water last May by admitting as much. 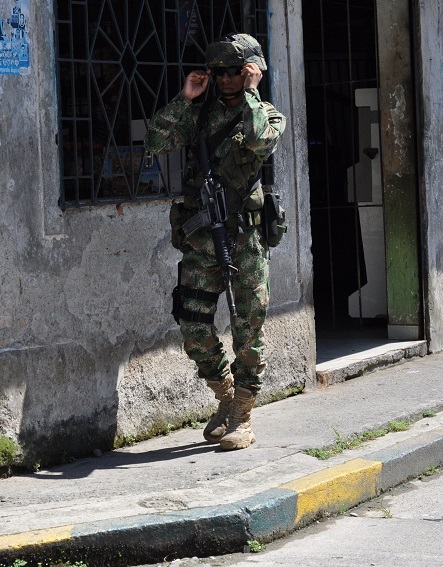 The use of security proxies and continued certification from the U.S. government that Colombia and Mexico are meeting human rights requirements for military aid skirt the spirit of the Leahy Law, which is intended to prevent U.S. funding of militaries that have committed gross human rights abuses. Given this close relationship, the reasons behind Mexico’s violence become clearer. When President Enrique Peña Nieto took office in 2012, he tried to shift the country’s attention to the economy and “moving Mexico forward.” But torture, arbitrary detentions, kidnappings and disappearances have escalated throughout his two years in office. Although the 43 students made international news, 5,098 Mexicans have been disappeared in 2014 alone. War on Drugs, or War on the Poor? “The War on Drugs in Colombia is a smokescreen for economic interests. Yes, drug trafficking plays a role in the violence here, but much more significant are neoliberal economic interests that seek to drive displacement so they can access Colombia’s land,” said a spokesperson for NOMADESC to a Witness for Peace delegation. “Plan Colombia paved the way for the U.S.-Colombia Free Trade Agreement a decade later. The fumigations displaced people from their land and left it free for illegal development, as well as creating an exploitable labor force in the cities,” said a labor organizer from Buenaventura, referencing the nearly20 million acres of land that was abandoned or illegally acquired in the course of Colombia’s conflict. “The crackdown in the countryside created a more favorable climate for foreign investment. In the end, the rich are the ones who benefit.” In this understanding there are clear parallels with NAFTA, which has contributed to mass displacement of a vulnerable labor force from Mexico’s countryside to the U.S. This analysis extends up to the current administration of Juan Manuel Santos. Less hardline than his predecessor, Santos has staked his presidency on a negotiated peace accord with the FARC and made the Victims and Land Restitution Law one of the first priorities of his presidency. Like his counterpart Barack Obama in the U.S., he is a technocrat friendly to big business; like Enrique Peña Nieto in Mexico, he favors extractive industries as the engine of the economy. Indeed, the peace process serves those interests by making Colombia more attractive to direct foreign investment, about which the Santos administration has been very forthright. But the continued collusion between private business interests and the new and shifting forms of paramilitarism suggests that even if the Colombian government negotiates an end to the conflict with the FARC, little will change for rural Colombians whose daily reality are threats, insecurity and violence. 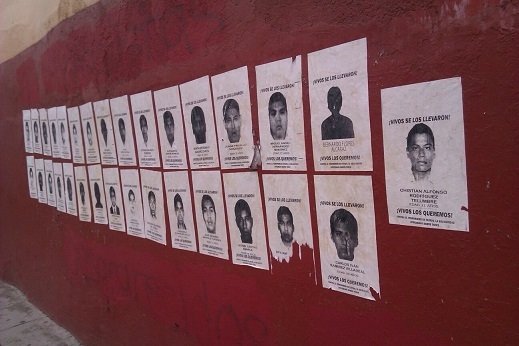 Photo: Pictures of the some of the 43 normalistas, or students, adorn a wall in Iguala, Guerrero. Credit: Maggie Ervin / Witness for Peace Mexico. Indeed, Colombians need only look to Mexico, where there is no armed insurgency, to see what the future might hold. Over this past year Pena Nieto’s administration successfully passed a series of reforms (labor, telecommunications, education, fiscal and energy) whose common thread is privatization. “Mexico is open for business” was the message, and the U.S. government and multinationals ate it up. The passing of these reforms may not have been possible had it not been for the exhausting distraction of six years of violence leading up to it, as Mexicans were displaced, terrorized and killed by cartels, Mexican security forces, or, all too often, by the collusion of both. Julia Duranti works for Witness for Peace in Colombia. She tweets at @juliaduranti. Maggie Ervin works for Witness for Peace in Mexico.